"This is a sweet Italian sausage meatball tucked inside of a beef meatball. Very yummy and a great conversation starter. This is a labor intensive effort, but it is one of the most flavorful and moist meatballs I've ever eaten. It is also a very fun way to serve a very standard but beloved dish. Serve with your favorite pasta." Form pork sausage into small 1/2-inch meatballs using a small scoop. Fill a skillet with enough water to make a 1-inch depth; bring to a boil, reduce heat to medium-low, and simmer. Cook meatballs in the simmering water until cooked through, about 15 minutes. Remove meatballs with a slotted spoon and cool on a paper towel-lined plate. Drain water. Mix ground beef, bread crumbs, ketchup, Parmesan cheese, Worcestershire sauce, egg, granulated garlic, and 1 teaspoon black pepper in a large bowl. Scoop ground beef mixture into about 1-inch portions using an ice cream scooper; form each portion around 1 small pork meatball to cover completely. 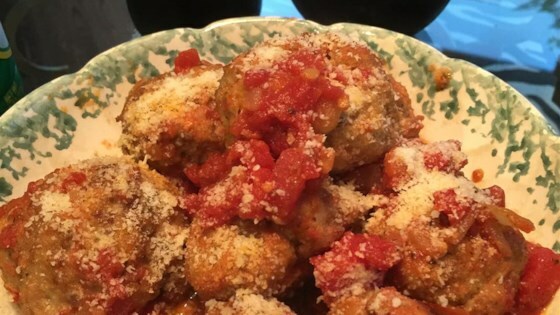 Arrange double meatballs on a baking sheet. Bake in the preheated oven until meatballs are browned and partially cooked, about 25 minutes. Heat olive oil in a pot over medium heat; cook and stir onion and garlic in the hot oil until onion is softened, about 10 minutes. Add crushed tomatoes, diced tomatoes, sugar, Italian seasoning, 1 teaspoon black pepper, basil, and lemon juice; bring to a boil. Reduce heat and simmer sauce for 20 minutes. Add meatballs to sauce and simmer, stirring gently, until meatballs are fully cooked, about 20 more minutes. My 5 pork sausage links made 28 meatballs, but my beef only made 20, so I have 8 nice little meatballs I'm going to cut up and use on pizza next week. I would imagine 2 1/2 pounds of beef would probably make 28 meatballs, or use only 4 links of sausage instead of 5 for 2 1/4 pounds of beef. Whatever works! You can use Butterball® lean sweet Italian turkey sausage links for a leaner meatball. I changed slightly to include 1 pound of Italian pork, 1 pound Italian turkey and I pound premium beef. Mixing all together and baked as instructed. Very tasty!